A ruined medieval church, the dedication of which is uncertain. The surviving sections of the tower and nave date to the 11th or 12th centuries, whilst the remaining part of the chancel is 14th or 15th century in date. As it is built of local carstone and iron conglomorate with occasional flint and limestone dressings, rather than mostly of flint, it is an unusual building. The church is now in an isolated position, but during the Middle Saxon, Late Saxon and medieval periods a settlement (see NHER 25962) surrounded it. The ruins of St Mary's or St James's Church. Built in the early and middle 12th century with the chancel being replaced and enlarged during the 15th century. The church fell into ruin in the second half of the 18th century. The church is constructed in the Romanesque style from carstone rubble. It is all that remains of the medieval village that once surrounded the church of which there are no extant structures. Archaeological deposits recovered from this area indicate continuous occupation of the area from the Iron Age to 16th century. Revealed north side of apse. D. Robertson (NLA) 6 October 2005. Late Saxon grave slabs, with interlacing pattern found on site of church ruins , this has been removed to KLM. See drawing (S13) in the Illustration Library. Church ruins, in deserted medieval village site. Late Saxon?, Norman and Gothic. Iron slag has also been recorded. For full details and press cuttings see (S3), (S4) and (S5). E. Rose (NLA) amended by M. Langham-Lopez (HES), 25 February 2013. See reference (S6) and photographs (S7) and (S8) in file. Essentially Romanesque Church. On hill, now isolated. Built of mixture of local carstone, iron conglomerate rubble, occasional flint and glacial erratic - unusually flint not dominant. Dressings of limestone from Barnack. Aisleless nave, central tower and late medieval chancel. Central tower Norman - two sides survive, long and short quoins below bell stage are Norman but of Late Saxon technique, bell stage of tower is later. North side of nave relatively complete, south wall has lost eastern end. Surviving part of chancel is 14th or 15th century. During the Time Team restoration two carved stones previously examined by N. Moore in February 1993 were drawn (S15 and S6) and then were replaced in the voussoirs. A third stone was drawn (S17) however this was retuned to the HBMC store. A. Rogerson (NLA) 6 September 1998. 3 October 1998. Section 17 Management Agreement signed (five years). D. Gurney (NLA) 23 January 2002. No evident fresh fall of masonry. H. Paterson (A&E) 21 June 2002. No apparent recent stone fall from fabric. H. Paterson (A&E) 9 July 2003. 6 January 2004. Section 17 Agreement received. H. Paterson (A&E) 15 January 2004. Before 1 January 2005. In topsoil after ploughing at TF 6624 2073. One rim sherd of Thetford type ware. E. Darch (NLA) 4 February 2005. H. Paterson (A&E), 5 September 2006. Scheduled monument consent granted concerning fencing around the exterior of the church. 5 year Section 17 agreement signed, backdated to 6 January 2009. D. Robertson (NLA), 1 April 2009. --- Aerial Photograph: TF6620 A-F,H-AL. --- Publication: Corbishley. M.. 1983. AM107. --- Archive: Ordnance Survey Staff. 1933-1979?. Ordnance Survey Record Cards. TF 62 SE 17 . --- Scheduling record: Ministry of Works. 1952. Schedule Report. --- Unpublished document: Robert Freakley Associates Architects. 1992. St James, Bawsey, Norfolk. --- Photograph: Ashley, H.. Bawsey (NK5915 to NK5921, NK5924, NK5925 and NK5928). --- Illustration: Ladbrooke, J.B.. 1831. Bawsey Church. --- Newspaper Article: Eastern Daily Press. 2010. Bells ring at ancient church to celebrate the harvest. 14 July. --- Publication: Pevsner, N.. NW Norfolk. --- Newspaper Article: Eastern Daily Press. 2010. Explore west to find our treasure. 1 November. --- Archive: Clarke, R. R. and NCM Staff. 1933-1973. Norwich Castle Museum Record Card - Late Saxon. Bawsey . --- Archive: Clarke, R. R. and NCM Staff. 1933-1973. Norwich Castle Museum Record Card - Medieval. Bawsey. --- Newspaper Article: Eastern Daily Press. 1979. Part of Norman arch stolen. 25 September. <S1> Unpublished document: Heywood, S.. Historic building report for St Mary or St James' Church, Bawsey St James, Norfolk..
<S2> Article in serial: Fairweather, F. H. 1931. Excavations in Norfolk; Summer 1930. Antiquaries Journal. XI No 2 pp 168-169. p 169. <S4> Newspaper Article: Eastern Daily Press. 1982. Photograph of St James' Church. 14 July. <S5> Newspaper Article: Lynn News. 1990. Risk List Compiled (photograph of St James' Church). 30 November. <S6> Publication: Batcock, N. 1991. 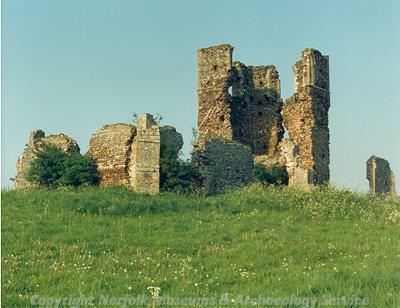 The Ruined and Disused Churches of Norfolk. East Anglian Archaeology, 51. Microfiche 5:G12. p 114. <S7> Photograph: BMG1, ELE 20-30. <S8> Photograph: Edwards, D. (NAU). Bawsey Deserted Church (ALK 15, ELK 10 to 14, ELN 2). <S9> Unpublished document: Heywood, S.. 1996. The Ruined Church of St Mary, Bawsey St James. <S10> Unpublished document: H. Paterson (A&E), MPP. Section 17 Management Agreement. <S11> Scheduling record: DCMS. 2007. Scheduled Monument Consent. <S12> Unpublished document: Norfolk County Council. 2008-2009. Section 17 Management Agreement. <S13> Illustration: Unknown. Unknown. Drawing of a stone from the ruined church at Bawsey.. Card. 3:1. <S14> Article in serial: Wilson, D. M. and Hurst, D. G. 1962. Medieval Britain in 1960. Medieval Archaeology. Vol IV (for 1961) pp 309-339. p 308. <S15> Illustration: Ashley, S.. 1998. Drawing of a carved stone from Bawsey Church.. Film. 1:2. <S16> Illustration: Ashley, S.. 1998. Drawing of a carved stone from Bawsey Church.. Film. 1:2. <S17> Illustration: Ashley, S.. 1998. Drawing of a carved stone from Bawsey Church.. Film. 1:2.